Hi everyone. I have a little digital cutting file tutorial for you today that I hope will be helpful to some. I’m making this little crabby card using some new digital cutting files. I have the Designer Edition of the Silhouette Studio software and I’m using it in this tutorial. In my humble opinion, I think this software upgrade is worth it because it really does give you some great functions. (and it goes on sale sometimes!) The ability to use SVG files and the pattern drag function are a couple that I really love. Here is the crab SVG. When I’m using a multi-layered image, I just copy all the parts onto my document and then just drag the parts I want to cut from a particular paper onto the cutting space. It just helps me keep organized and size everything properly. In the Designer edition of the software, I can fill a shape with any digital paper in my stash simply by dragging the thumbnail of the pattern into the center of that shape. Awesome huh? Once I have that pattern in there, I can scale it or rotate it using the pattern tools. Just click the pattern icon at the top right, then choose “Advanced Features” at the bottom of the side bar. You can use the tools here to make your pattern larger, smaller or change its angle. Now you just need to turn on the cut lines for your shape. Select the shape, choose the scissor icon and select “Cut”. Don’t forget to turn on your registration marks for printing. Then send to Silhouette to print and cut. So… that works…. but sometimes when you have small detailed cuts (like the legs here) it can be a challenge for the blade to cut each one perfectly and sometimes you end up with tiny white edges where the blade went outside the colored area slightly. One way to fix this easily on the fly is to create a quick fill shape. Create a shape (circle, square, whatever works) that extends a bit beyond the shape you want to cut. Set the cutting lines – you want the crab cutting lines on and the fill shape cutting lines off. Add a pattern paper to the fill shape just like we did before. Make sure the full shape is on top (if not use Object – Arrange – Bring to front to move it). You can now print and cut and not have any problem with white edges. Usually you don’t even need the registration marks if you have a bit of space around the cut lines (although you do have to print the page first LOL!). I sometimes use this method when I have something that just won’t quite fit in the registration mark area. I hope some of you out there found this little tutorial helpful. The bundle contains 4 of Amber’s beautiful layered template designs and 23 layered digital cutting files. So the package can be used for digital pages, physical pages or even a mix of both as well as other projects. 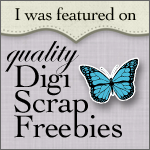 This entry was posted in Cutting Files, Tutorials and Quick Tips and tagged Cutting files on August 17, 2013 by Cathy.